In today’s competitive market, saving money is more important than ever. Efficiency is also paramount as businesses grasp at anything that can help them compete. One of the most expensive and least optimized areas for most businesses are their print environments. Printing operations are costly, and high cost means low efficiency. Here’s how using remanufactured toner can help firms stay in the black. Remanufactured ink comes from cartridges that are sent in, refurbished and refilled with fresh ink and sent back. It’s like recycling for ink cartridges. Using remanufactured ink cartridges can save a lot of money, 15-20% per order to be exact. Some prices can be even more enticing. Take Epson for example. Some remanufactured Epson ink cartridges can cost between 56-70% less than buying standard OEM cartridges. That’s a lot of money! Don’t waste money on brand new OEM ink, reallocate that money to where it’s needed most and keep saving on aftermarket toner. Businesses looking to save a buck on printing without compromising on quality should consider using remanufactured toner. 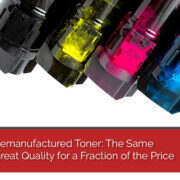 Remanufactured toner comes at a fraction of the price of brand-new toner and can deliver much the same quality. The days of excess are over, for now, and that means getting smarter about printing. Using remanufactured ink is smart printing in today’s market. With remanufactured toner, companies can print more than their competitors without breaking the bank. 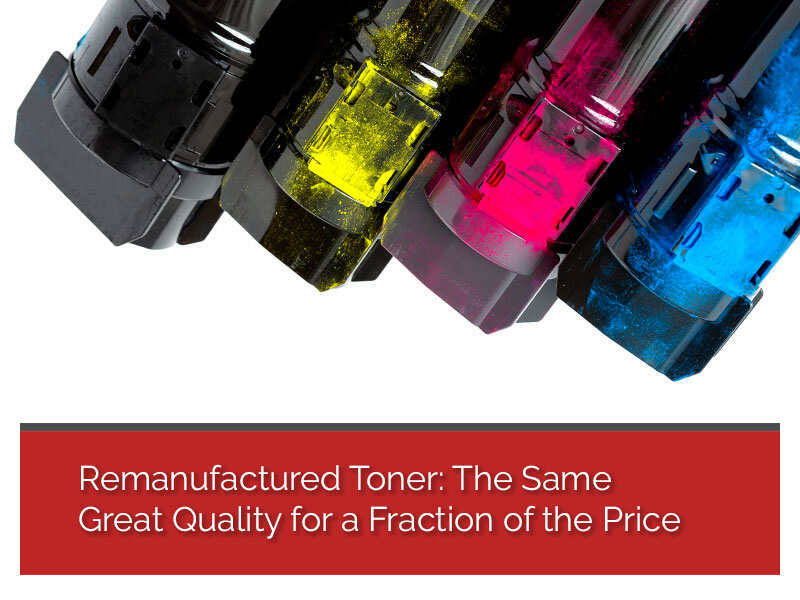 There are some important considerations to keep in mind when ordering remanufactured toner. Make sure that there is a warranty and that the company has a solid reputation for customer service. The rule of thumb is that companies that offer a warranty or guarantee are generally more reliable. At Smile, they offer a 100% guarantee on both remanufactured ink and toner. Properly produced remanufactured toner will not damage print heads, leak, or deliver inferior quality. To ensure that the cartridges are properly produced, check with the vendor and ask if their product meets OEM standards. Also, be sure to ask if they are certified by the Standardized Test Methods Committee. By making sure that discount ink cartridges go through production according to industry standards, there’s nothing to worry about when it comes to printing quality. Checking these standards is an important part of the vendor vetting process and helps ensure that quality won’t be an issue. The extensive testing that performed on remanufactured ink and toner is rigorous. That means that firms don’t have to sacrifice quality for the value. The modern consumer is typically much more concerned about the state of the environment than in previous years. Their interest in environmental responsibility has grown rapidly, and it shows in their favoritism of businesses who stand up for the environment. Buying brand new ink and toner every time is wasteful both financially and ecologically as millions of discarded cartridges end up in landfills every year. Remanufactured cartridges are economical in terms of environmental and financial costs. The contrast is quite clear. Forward-thinking managers will use remanufactured toner at every opportunity to help save money and the environment. Customers will appreciate this as well as the budget. As many managers know, ordering printer ink can be a headache, more specifically keeping apprised of which printers are running low on ink is quite laborious. This labor can be effectively outsourced to an MPS or managed print service like Smile. Managed print services save firms a lot of money in the long run. They also save time and ensures that no one must keep a careful eye on ink levels because the service automatically monitors all of that. When ink is running low, the managed print service will notify the client company and have more ink ordered and on the way, before the machines go down. There’s nothing wrong with discount ink cartridges, especially when partnering with the right supplier. When looking for the best supplier of aftermarket toner, Smile is the premier choice on the market. As part of their managed print services, they supply printer ink when needed. They also monitor the printers and their ink levels, and ink will be on the way by the time the printer starts running low. All of these benefits make Smile the smart choice for optimizing print environments in businesses of any size. Have a chat with Smile today and get the finest in aftermarket toner. They never compromise on quality and provide superior remanufactured ink at an unbeatable price, guaranteed!